"I'm scared shitless of her... She's a physically intimidating presence," a male former colleague of Omarosa's told me. 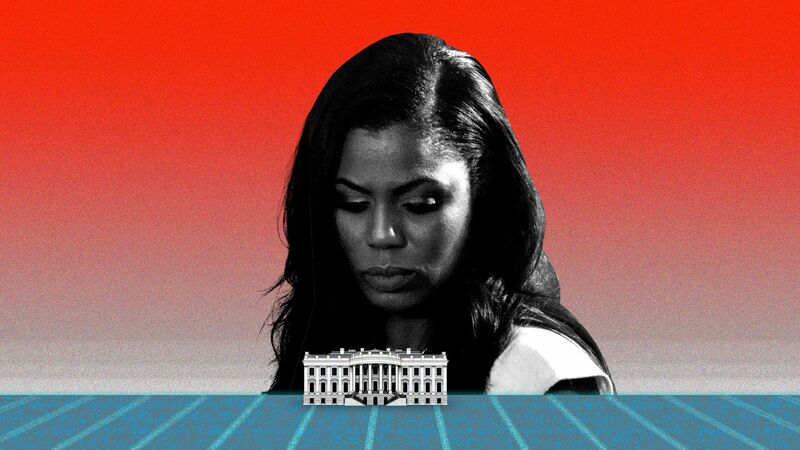 The big picture: Trump has nobody to blame but himself for Omarosa's raucous book tour, in which she calls him a racist and a misogynist, and says he's in mental decline. Trump brought her into the White House at the senior-most level with the top salary. A scene that caught the attention of West Wing officials and national security lawyers today: Omarosa let NBC's "Meet the Press" host Chuck Todd play tapes of White House chief of staff John Kelly, whom she secretly recorded while he was firing her. Why this matters: It's extraordinary enough to secretly record a White House colleague and then play the tape on television. But it's even more stunning that the conversation happened in the Situation Room — the most secure area in the West Wing, reserved for the most sensitive conversations, many of them dealing with highly classified intelligence. Behind the scenes: I spoke to several Trump officials who've spent time in the SitRoom. They say Kelly and the White House lawyers — especially Uttam Dhillon, who was recently appointed to head the Drug Enforcement Administration — used the SitRoom to talk with staff they were accusing of serious breaches, including problems with their clearances. You have to lie and intentionally subvert the rules to get a recording device into the SitRoom, which is actually a group of several secure meeting rooms. When White House officials enter the secure area — after getting buzzed in while a security officer watches through a keyhole camera — they immediately enter a lobby with a wall of lockers. They are required to put their phones and any other electronic devices, like Apple watches, in the lockers. They hold onto the locker key while they take their meeting in one of the conference rooms. In the recording Omarosa played on "Meet the Press," Kelly refuses to elaborate on the "pretty serious integrity violations" he tells her she committed. The bottom line: Omarosa says Kelly threatened her and she made her secret recording to protect herself. And to be clear: the conversation was not classified, meaning she may not have broken federal law. But national security lawyers I've spoken to say it’s nonetheless disturbing. Josh Geltzer, who was a senior director for counterterrorism in Obama's NSC, told me: "Bringing a recording device into a secure facility like the SitRoom is wildly in violation of protocol. Devices like that represent vulnerabilities that hostile actors can exploit to hear sensitive conversations — that's why they're kept out so strictly in the first place." The Space Force has caused its first collateral damage, exacerbating tensions between the White House and Trump’s reelection campaign. Multiple sources tell me White House officials were surprised when, shortly after the Vice President gave a sober speech announcing Trump administration plans to develop a Space Force, the campaign blasted out an email fundraising off the idea. "As a way to celebrate President Trump’s huge announcement, our campaign will be selling a new line of gear," campaign manager Brad Parscale wrote in an email to supporters. "But first we have to make a final decision on the design we will use to commemorate President Trump’s new Space Force — and he wants YOU to have a say." Behind the scenes: Senior officials told me the White House had no knowledge of this plan. Trump campaign response: Michael Glassner, chief operating officer of the Trump campaign, told me the campaign "decided to celebrate the president’s innovation and include our supporters in the spirit of it by having them vote on the best caricature logo from six options, which are of course completely unofficial." "The winner will be imprinted on t-shirts, which will then go on sale on our online store." "Stay tuned for the results — the shirts will no doubt sellout like most of our Trump campaign gear." At first, White House officials thought the idea of Space Force was just a lark. A former senior official told me that through most of last year Trump was generally interested in space. He would ask random questions about rocket ships and marvel to hear about satellites and the junk floating around in space. His questions were unfocused, like a student trying to learn about a new subject. "It was just one of those subjects that piqued his interest," the source said. Early this year, Trump became more fixated on space and floated "Space Force" as an off-the-cuff idea. Staff didn't take the idea seriously at first, and Defense Secretary James Mattis was not a fan, but Trump kept insisting on it. He floated the idea publicly in March when he spoke to military personnel in San Diego. "You know, I was saying it the other day, because we're doing a tremendous amount of work in space, I said maybe we need a new force, we'll call it the Space Force," he told the crowd. "And I was not really serious. And then I said what a great idea, maybe we'll have to do that." Why this matters: Space "is becoming a contested war-fighting domain, and we have to adapt to that reality," said Mattis in Thursday's announcement at the Pentagon. Russia and China are building anti-satellite weapons that could shoot down American satellites within two or three years, according to the U.S. intelligence community. This would undermine the U.S. military's ability to keep watch over its adversaries and track American troops using GPS coordinates. A key cabinet meeting came in March, where Vice President Mike Pence — who chairs the National Space Council — gave an update on space issues. Arrayed before Trump on the table in the meeting room were models of commercial rocket ships, including one from Elon Musk’s private rocket company SpaceX. Trump was delighted, according to a source in the room. "Rich guys, they love rocket ships," Trump told the group. "And that's good. That's better than us paying for it." Behind the scenes: After that meeting Trump began talking about the idea more insistently with officials including Pence, Director of National Intelligence Dan Coats, and Secretary of State Mike Pompeo. Trump told Pence to get it done. Pence has long been interested in space, especially from military and commercial perspectives. What's next? Whether a Space Force happens or not is still in Congress' hands. And senior Pentagon officials, including Defense Secretary Mattis and Secretary of the Air Force Heather Wilson, have expressed reservations about it. Mattis is warming to the idea, according to a source familiar with his thinking. On a White House conference call with Iran experts last week, a senior administration official said the Trump administration will reimpose sanctions on financial messaging services later this year. That might sound boring. But the administration official was referring to what could soon become another major fight between the Trump administration and Europe. Why this matters: In the context of Iran sanctions, "financial messaging services" refers to SWIFT (Society for Worldwide Interbank Financial Telecommunication) — a linchpin of the global financial system that facilitates payments across borders and connects more than 11,000 banks around the world. SWIFT cut off Iran from the global financial system in 2012 as a result of American pressure on the Europeans to crack down on Tehran. Then SWIFT reconnected Iran after Obama secured the nuclear deal with Iran. "SWIFT is the backbone of the global financial system and without access to SWIFT Iran can't move money around the world, cannot get paid for oil, pay for their imports and would have a difficult time financing its activities abroad," said Mark Dubowitz, an Iran hawk who heads the Foundation for Defense of Democracies and was on the call last week. "The administration seems committed to financially and economically squeezing the regime using all instruments of national power," Dubowitz added, "and has already signaled that it will bring back the SWIFT sanctions to deny Iranian banks access to the SWIFT system." Behind the scenes: Following Trump's withdrawal from the Iran deal, in May, the Europeans have been fighting to keep the deal alive and to make sure that enough money is flowing to placate Iran's leaders. A big part of that is ensuring that Iranian banks remain plugged into the SWIFT network. A U.S. source in close touch with senior European officials tells me they want to shield SWIFT from U.S. pressure to expel Iranian banks. But Trump officials are signaling they may even sanction SWIFT officials if they keep Iran connected to the global financial system. What's next? SWIFT is governed by a board of directors, including senior executives from the world's largest banks. In November, the board will have to decide whether or not to call Trump's bluff. "Regardless of the views of European political leaders, SWIFT may want to protect the integrity of its financial messaging platform from the illicit financial activities of Iranian banks that will be re-sanctioned by the administration," Dubowitz told me. If they do call Trump's bluff, the president will have to decide whether to take the unprecedented step of sanctioning top executives from the world's leading banks, like Citi and J.P. Morgan. Bottom line: This issue isn't getting much attention yet, but it could become one of the biggest brawls between the Trump administration and the EU. All signs point to Brett Kavanaugh, Trump's nominee to replace Justice Anthony Kennedy on the Supreme Court, getting the 51 votes he needs for confirmation this fall. The senators usually considered swing votes on the Republican side are either outright saying they'll vote for Kavanaugh (Kentucky's Rand Paul) or signaling pretty strongly that they'll do so (Maine's Susan Collins). The progressive anti-Kavanaugh campaign hasn't gained much momentum yet, or delivered anything close to a fatal blow. And vulnerable red state Democratic senators up for re-election this year are signaling they're open to supporting Kavanaugh. What's next: Kavanaugh expects to meet on Capitol Hill this week with two of those red state Democrats — North Dakota's Heidi Heitkamp and Indiana's Joe Donnelly. The team preparing Kavanaugh for his confirmation — led by White House Counsel Don McGahn, with Raj Shah running communications — is deep into mock hearings, staged in the Eisenhower Executive Office Building beside the White House. The House is on summer recess. Monday: Trump addresses a signing ceremony for H.R. 5515, the "John S. McCain National Defense Authorization Act for Fiscal Year 2019" in Fort Drum, NY. The president then hosts a roundtable with supporters in Utica, NY, and speaks at a political fundraiser. Tuesday: Trump is back at the White House. He'll receive his intelligence briefing and have lunch with the Secretary of State Mike Pompeo. Wednesday: Trump receives his intelligence briefing. Thursday: Trump hosts a cabinet meeting and has lunch with Vice President Mike Pence.